Florida is our oldest and largest chapter and our GOTV efforts have contributed to a 22-point increase in state wide Muslim voter turnout from the 2014 midterm election. 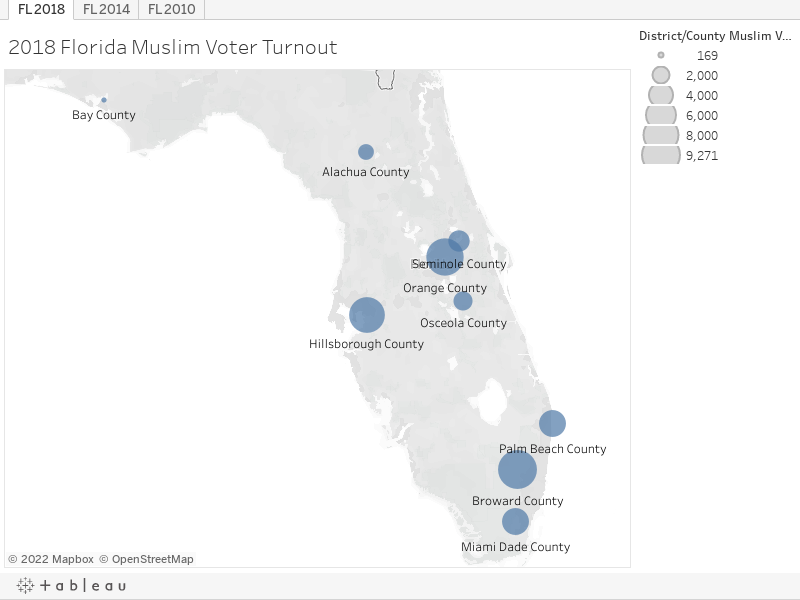 Across Florida, 53% of registered Muslim voters in the state turned out on November 6. While the percentage of voter turnout wavered from 2010 to 2014, the number of registered voters has continued to increase midterm over midterm, resulting in the number of voters growing in each election. Emgage worked in nine counties across the state: Broward, Miami Dade, Orange, Alachua, Bay, Hillsborough, Palm Beach, Seminole, and Osceola. All nine counties saw significant increase in voter turnout. Six of the nine counties met or exceeded the state wide 22-point increase in voter turnout: Broward, 24-point increase; Miami Dade, 23-point increase; Orange, 26-point increase; Alachua, 28-point increase; Hillsborough, 22-point increase; and Seminole, 29-point increase. While the percentage of voter turnout wavered from 2010 to 2014, the number of registered voters has continued to increase midterm over midterm, resulting in the number of voters growing in each election. Please mouse over the charts to see specific data points.